A Sampling Bee: Gilbert's Craft Sausages Review & GIVEAWAY! 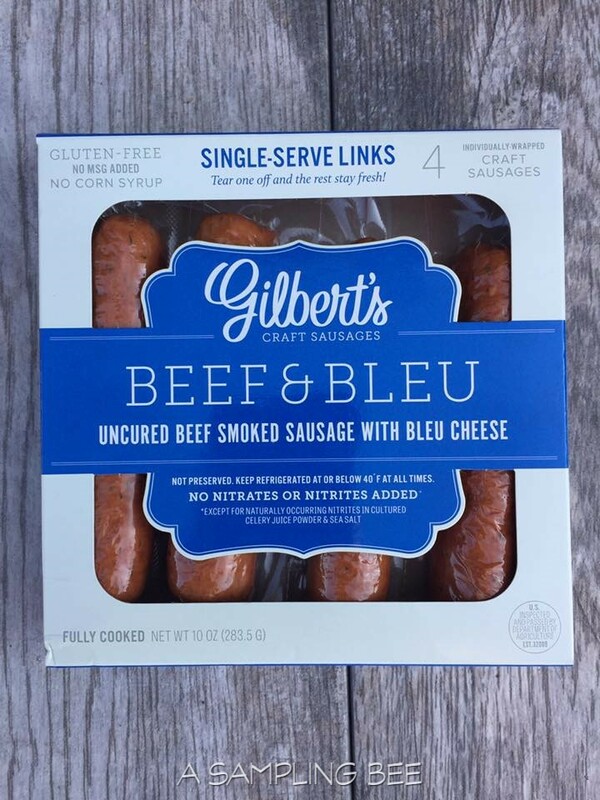 Gilbert's Sausages contain NO nitrates, hydrolyzed soy protein or MSGs. 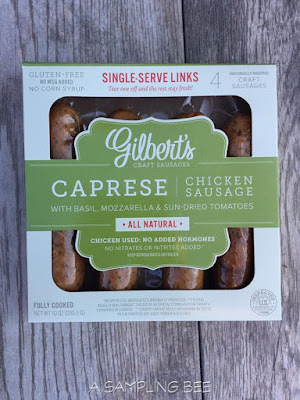 These sausages are made with better ingredients such as beef sirloin, gluten-free craft beer, and natural preservatives such as sea salt, cherry juice and celery juice powder. The ingredients used in their sausages are nothing but the best. I know this not only because I got to try them, but because I can pronounce every ingredient that's listed on the package. 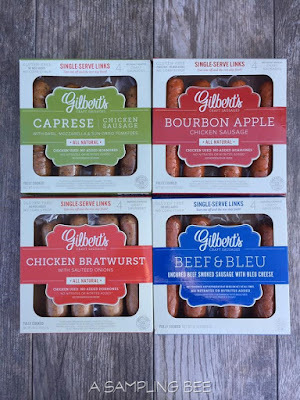 Gilbert's Sausages come in 9 awesome flavors: Caprese, Chicken Bratwurst, Beer Bratwurst, The Froman, Beef & Bleu, Bourbon Apple, Kale, Beef & Cheddar and Aloha. 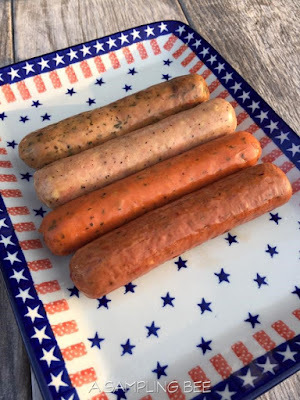 The Beer Bratwurst is the world's first gluten-free brat! I got to try the Caprese, Chicken Bratwurst, Bourbon Apple and Beef & Bleu flavors. Oh my, SO good! 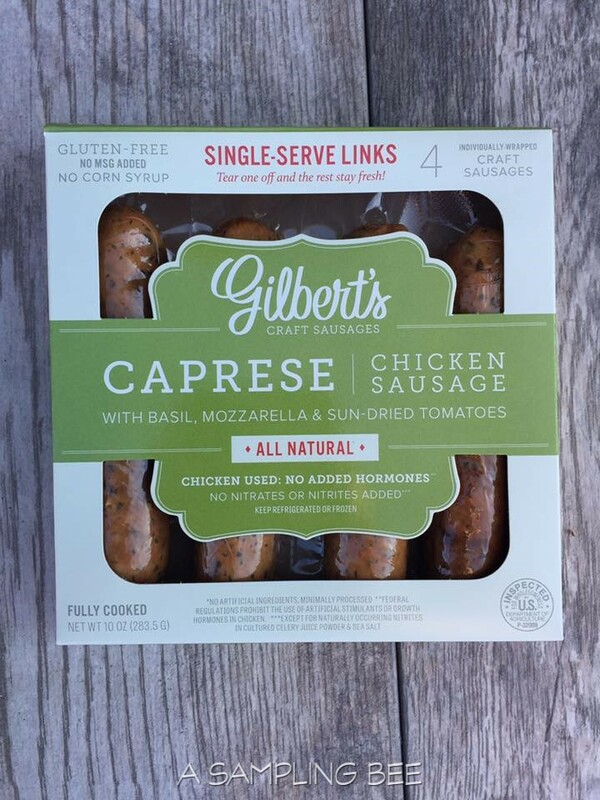 The Caprese Chicken Sausages contain Mozzarella, Basil & Sundried Tomatoes. The Bourbon Apple Chicken Sausage contains Dried Apples & Bourbon Whiskey. The Chicken Bratwurst contains Sauteed Onions. 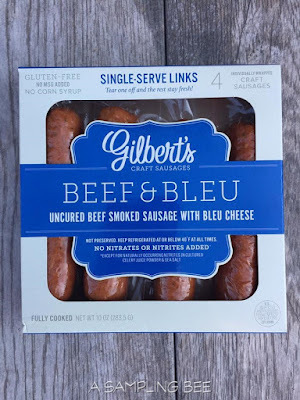 The Beef & Bleu Beef Smoked Sausages contain Bleu Cheese. From top: Caprese, Chicken Bratwurst, Bourbon Apple, Beef & Bleu. 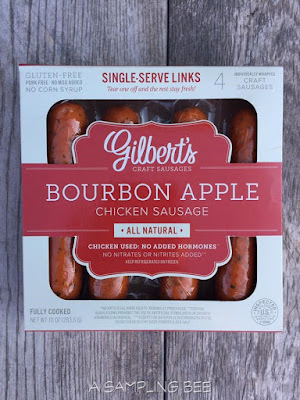 Gilbert's Sausages are so delicious! Their unique flavor combinations are perfect and their sausages are the best that I have had. I love how the sausages are fully cooked and ready to eat. I just have to warm them up and serve! Super easy for a mom of two. 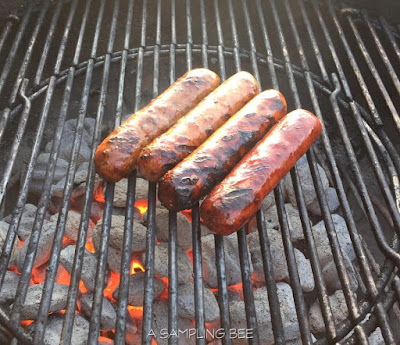 We cooked the sausages on the grill and, boy, did they satisfy our hungry tummies! The best thing, besides the sausages being out-of-this-world good, is that they don't contain any yucky ingredients and no nitrates! 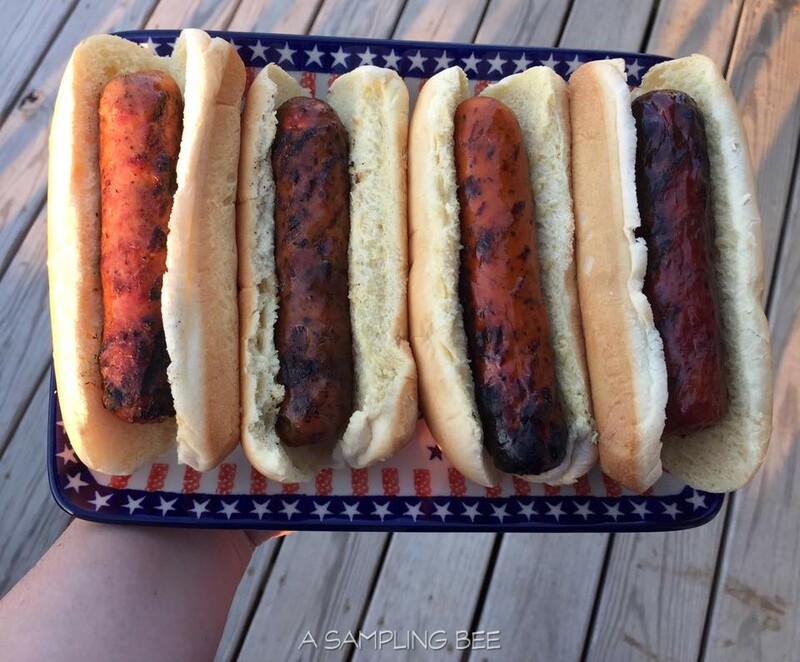 It's extremely hard to find hot dogs or sausages that do not contain nitrates. Out of the 4 flavors that I got to try, my favorite would have to be the Caprese. 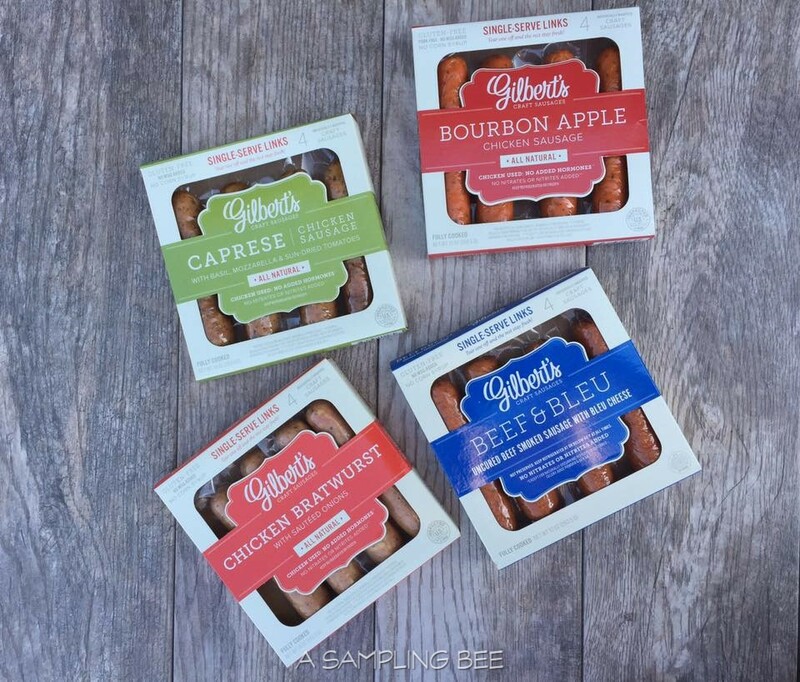 Thank you, Gilbert's Sausages for making delicious sausages as well as healthy food for my family! 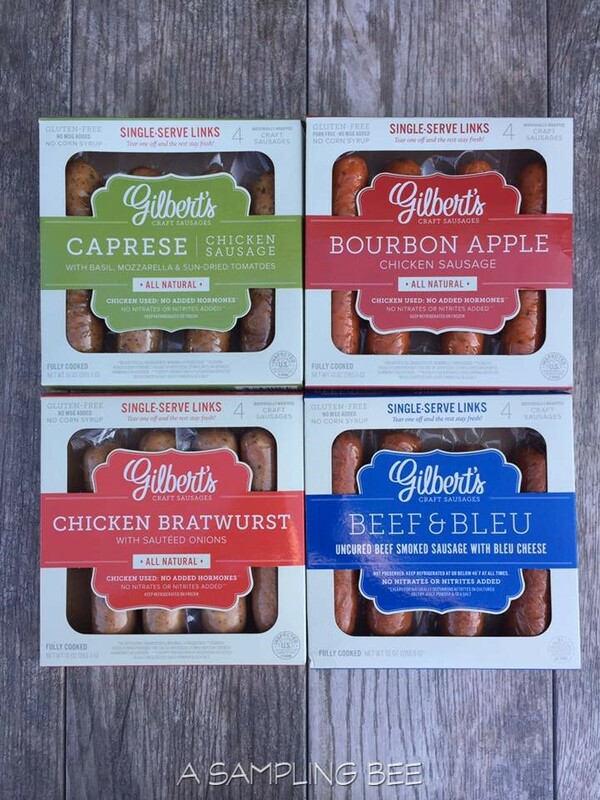 Forget plain ole sausages, grab Gilbert's Sausages today! 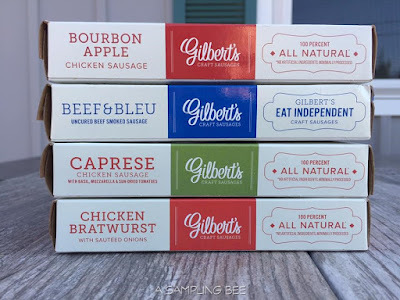 I received Gilbert's Sausages in exchange for my honest review. All opinions are my own. Always! 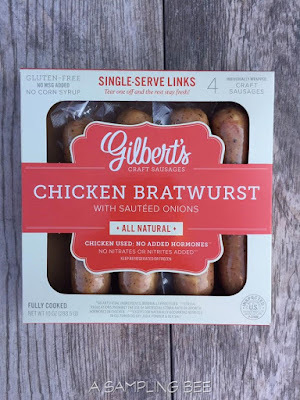 Visit https://gilbertssausages.com for more information. Enter to win 4 free product coupons for Gilbert's Sausages! One winner will be chosen and will be notified via email. Winner will have 48 hours to respond. US only. Good luck! I would love to try the chicken bratwurst. Thanks for the nice giveaway. I can't follow Gilbert Sausages on Twitter as it comes up as this page doesn't exist. Thank you for letting me know, Karen. I have fixed the link. So sorry. These are seriously the best sausages I've ever had and my 1 year old even loves them so that says a lot! The beef and bleu flavor sounds fantastic. I am most interested in the bourbon apple variety, but all of them look great. I love to eat sausages wrapped in a warm tortilla. They all sound delicious, but i think the beef & bleu sound the best because i love bleu cheese!! I love that these do not have nitrates! I would like to try the beef and bleu cheese burger. My husband loves his sausage.